We spent the evening with some good friends, C & S, as they were hosting a NYE party. My husband & I wanted to help them prepare some of the food that they would be serving (to about 20 people or so, plus a few kids). We first had these sandwiches on Christmas Eve, made by C’s sister. The three of us decided to recreate them for New Years, with just a few twists. These are not the healthiest sandwiches in the world, but they have GREAT flavor & are a hit at any get-together. They’re best served nice and hot, fresh from the oven. In a saucepan, melt butter and mix in mustard, worcestershire sauce, and onion. Simmer for several minutes. Cut the entire pack of rolls in half, horizontally, so that you can make small sandwiches out of them. 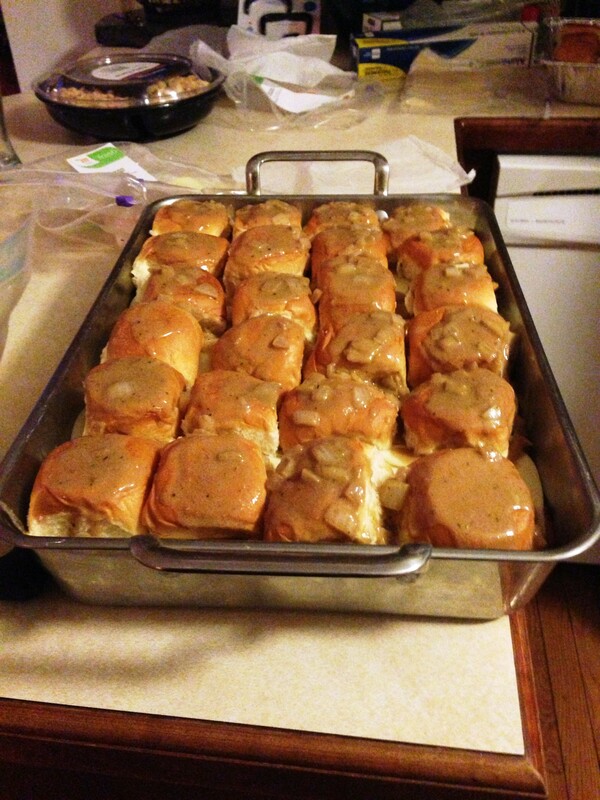 In a greased 9×13 baking pan, place the bottom halves of the rolls, and spread 1/3 of the butter-onion mixture over them. Place a folded slice (or two) of roast beef on each roll. Then, layer slices of provolone cheese over all. Replace the tops of the rolls and spread the remaining onion mixture over top. Sprinkle liberally with the Penzeys blend. Cover and bake for 15-20 minutes. Once they are finished baking, seperate with a spatula & serve. We served these with a horseradish mayonnaise of mayo, horseradish, salt & pepper. Since we were serving a significant amount of people at the party, we doubled this recipe, and made a double batch of the original ham & swiss sandwiches.